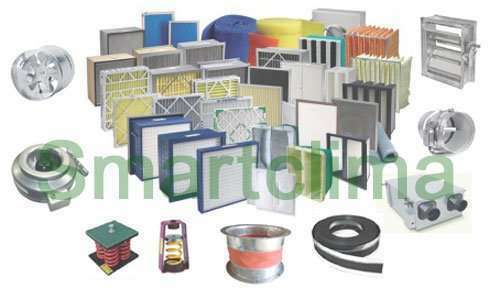 Ventilation Material is used for ventilation project. 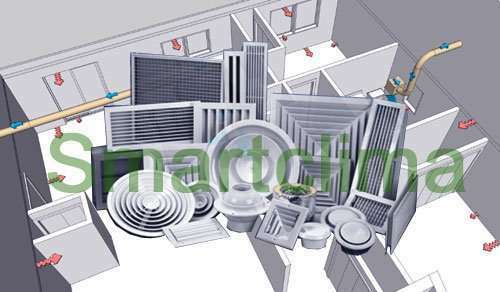 Ventilating in an important part in the field of HVAC.It is a process to exchanging air,fresh air coming to replace old air/The old air will be drain out to outdoor.In any space,ventilation process provide quality & fresh indoor air by automatic controlling temperature to remove smoke, heat, moisture,odors,dust,carbon dioxide,airborne bacteria). In our life,just because ventilation is used to get out unpleasant smells,and take in outside fresh air, let fresh air circulate in interior building.Allways,when we are talking ventilation,we also will mention heat recovery ventilation, it is an energy recovery process.The heat recovery ventilation system using equipment(usually is heat exchager) to provide fresh air in and drain indoor air out. Two air will take place energy exchanging in the heat recovery device. The result is that building efficiency is improved and energy cost is reduced. 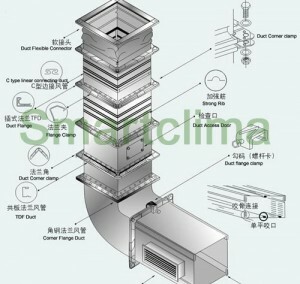 From Smartclima understand, Ventilation Material/devices include air terminal device(grille, diffuser,roof ventilator) for wind outlet or inlet,air ventilation duct for transfer wind,filter/damper/muffle/baffle for duct affilication part,air heat exchanger to recovery heat drain out outdoor,air fans to drive air,and duct accessories for duct system building,and insulation materials. Smartclima try best to supply quality air ventilation material.Ventilation can be divided into “Mechanical” and “Natural ventilationor”. “Mechanical” ventilation is also named with “forced” ventilation,which is used to control indoor air quality. Kitchens and bathrooms typically have mechanical exhaust to control odors and sometimes humidity. Natural ventilation is the ventilation of a building with outside air without the use of a fan or other mechanical system. It can be achieved with openable windows or trickle vents when the spaces to ventilate are small and the architecture permits. 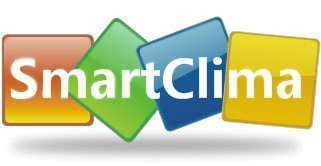 More types of Air Conditioner Ventilation Materials are not displayed on the web.If the item above doesn`t meet your requirement,please contact us to email: sale@smartclima.com ,we can supply a favourite item you need. Ventilation ducts. In a ventilation system, relying on ventilation tubes into or out of the air. Ventilation pipes circular and rectangular cross-section. In addition to the straight tube ventilation pipe from the elbow, bend back and forth, adjustable bends, tees, crosses and other fittings combination according to their actual needs. Ventilation and air conditioning engineering common duct ordinary steel sheet, galvanized sheet steel, stainless steel, aluminum and other metal duct, rigid PVC plates, plastic composite steel (steel sheet surface by spraying on a common house 0.2-0.4 mm-thick plastic layer) and glass fiber reinforced plastic wind pipe. Fiberglass duct insulation and no insulation is divided into two categories, not fiberglass duct insulation called FRP duct, FRP duct with insulation (ie, honeycomb sandwich panels or insulation sandwich) tube called a sandwich structure of the duct. Another brick, concrete, slag, gypsum board made of duct. Various types of air. In order to indoor feeding or discharging indoor air, the ventilation tube disposed on the various types of suction inlet or outlet, or to adjust the feed amount of air sucked out. Many types of air, common type is equipped with a rectangular mesh vents and bar grille with linkage adjustment device, no other type of linkage adjustment. Outlet is divided into single, double, triple and different forms of diffuser. The valve. Mounted on the duct to adjust the air flow and ventilation components individually closed manifold. Ventilation and air conditioning valves have common flapper valve, butterfly valve leafy, round open flap type start valve, air treatment chamber bypass valve, fire dampers and check valves, etc. Flexible short pipe (hose fittings). Used for duct connection with the device, and its main role is to play the role of stretching and isolation to prevent fan vibrations transmitted through the duct interior noise caused by the short length of the flexible pipe generally is 150-250mm. Local exhaust hood. The main effect of this is issued by the residual heat in the device. Local exhaust cover the most common are the umbrella hood, side exhaust hood and exhaust several cabinet. The flap. Flap is one of components spray chamber is divided into two front flap and rear bumper water board. In addition to the role of the front flap of the blocking process may splashed water droplets, but also into the spray chamber so that the air flow evenly through the entire cross-section, so also called wind deflector plate or wind or water separator. After the weir stiffened dehydration, usually made of galvanized steel or glass. The air filter. Is a kind of indoor air dust into the air purification equipment, can be divided into early effect (pre-filter), in effect, high efficiency filter. Muffler. Means for preventing noise incoming indoor uses. There resistive take along sound in air conditioning engineering employed, take along sound resistant smooth, wide-band resonance composite muffler and muffler. Dust catcher devices.It is a device to purify the air, generally divided into the cyclone dust collector, wet scrubbers and fabric filters. Ventilation fans. 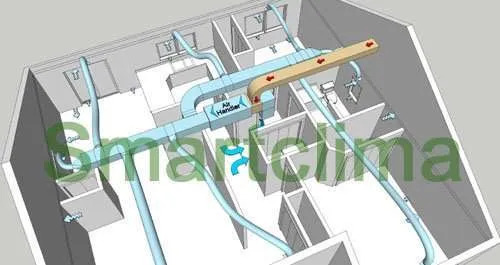 Mechanical ventilation system, forcing air flow machinery. Fan is the main equipment, ventilation and air conditioning systems, according to the construction principle into axial fans and centrifugal fan types. Air conditioning and refrigeration systems. Refrigeration system is installed in the form of generally: ① after single-mounted type, ie refrigeration compressor, condenser, evaporator, and various auxiliary equipment such as refrigeration piping components connected single installation of refrigeration systems, supporting a centralized cooling system called: ② whole-mount refrigerator that is, the overall installation in the form of a condenser, evaporator, and various auxiliary equipment are factory-assembled on a common base. Tricking room. It is a multi-functional air-conditioning equipment, can be made of steel or concrete, built with a nozzle and nozzle to water supply pipes, fittings, etc., the lower part of the pool is equipped with drainage, overflow, water treatment and suction devices. Blinds. To block the entry of outdoor debris and rain, with the decoration. The heater. Is to ensure that the air sent into the room with a certain desired temperature and relative humidity of the device, is divided into primary heater and a secondary heater. Before using water spray or surface cooler room heater called a heater to raise the temperature and increase air moisture absorption capacity. After watering with room heater or cooler surface is called a secondary heater for heating the air chamber after watering, with certain requirements of the temperature and relative humidity. Hood. It is used to the end of the exhaust system, and its role is to exclude the dirty air to the outside. Divided according to their form: for general mechanical ventilation system umbrella hood for the tapered hood dust removal system for simple-shaped hood with natural ventilation system. Cooler. Cryogenic coolant water and brine for surface water-cooled chiller called surface cooler; refrigerant used as refrigerants (such as Freon), called direct evaporative cooler surface. Flange (referred flange). The connection between the components duct duct and fittings or between. Between the components used to connect the duct between the duct and fittings and the. Used between the duct and the duct and fittings to extend access and increase the strength of the wind. Can be divided into sections according to their shape and rectangular flange round flange. We are building a ventilation project,need all necessary materials for our project,are you providing one-stop serive to supply all our need? Good day, Greetings from South Africa!We are a company specialized in building ventilation project. I would greatly appreciate if you can email me a detailed list of your ventilation materialss and their associated prices.Thank you for your prompt responds.